The first real organised governance of Tobago began when British Lt Governor Alexander Brown landed in King’s Bay on November 12, 1764, where he was greeted with a guard of honour. At the point in time, the capital was at Studley Park, in a settlement called Georgetown which was constituted mainly for the shipment of sugar under the watch of Fort Granby. The Tobago House of Assembly (THA) was incorporated in 1768 with a 13-member board comprising mainly planters. It also encompassed an appointed legislature. Tobago’s capital soon shifted to Scarborough (1769), which was better suited for development and in 1770 Fort King George was erected. The THA met in one of the barrack-rooms of the Fort. The island then entered a period of unrest which saw it finally ceded to the British by the French in 1803. In 1816 the THA formed an island motto She Grows More Beautiful—Pulchrior Event—and the decision was taken to build a permanent and suitable home for the government which would also serve as a court house. A site was selected overlooking Market Square in Scarborough (which before 1807 was a market for African slaves and is now called A P T James Square in honour of a local politician). The foundation stone was laid on April 23, 1821, by Governor Sir F P Robinson. The building was completed in 1825 and included a courtroom, chambers for the THA and an office for the Governor. The basement floor was constructed of Scottish firebrick, imported as ballast in the holds of sugar ships, and contained a stable as well as a small jail cell. The upper floor was of mortared and un-plastered limestone quarried locally. An interesting example of harmony was that both Protestant and Catholic services were conducted in the court room until houses of worship were built for both denominations. Initially, the structure was planned to be two stories high, but financial constraints saw the completion of the lower storey only and a roof being placed across it. In 1877 the semi-autonomous THA charter was suspended and a traditional Crown Colony government installed. 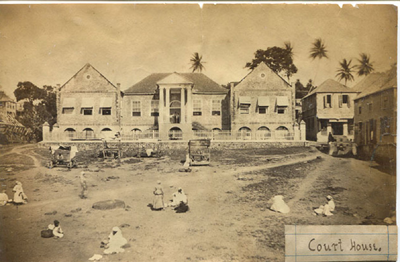 When the island was twinned with Trinidad in 1889, the post of Governor and the Legislative Council were abolished and an administrator appointed with a single representative for the entire island appearing on the legislature in Trinidad from 1898. A wonderful Georgian portico and Roman columns once existed, but these were removed in the 1950s, giving the structure a more bland appearance. The clock was installed in 1880. In 1980 the THA charter was restored with the Hon, A N R Robinson as its chief secretary. Today, the building is in reasonably good shape considering its age, but is in need of a sympathetic restoration. The old court room where the Assembly meets is a wonderful look back into yesteryear with its ancient wooden gallery and raised dais where the judge would have sat. The majority of THA administrative functions have been transferred to its offices on Darrel Spring Road, outside Scarborough. How to get to Tobago ?